When it comes to gadgets, American women are most likely to get a digital camera or an iPod for Christmas this year. 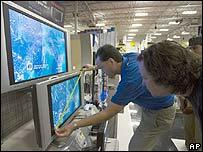 So expects Jeremy Clay, a personal shopping assistant at a Best Buy store in Walnut Creek, California. He is in a position to know. He has been helping lots of husbands coming into the US electronics superstore. The same two gadgets ranked high in a study recently conducted by consultancy IDC. The report, entitled Women on Holiday Shopping: The Most Wonderful Time of the Year!, surveyed more than 1,000 women, mostly in the US, but included some in Canada and Mexico. They were all members of the Women in Technology International organisation, which brings together tech-savvy and affluent women. IDC looked at what these women were buying for other people. Digital cameras, iPods and other MP3 players, accessories for iPods and laptops were the most common gadgets on the list. But while the women were getting presents for others, they were buying gifts for themselves. "It's 'let's just pick one up for me as well'", said Dana Thorat, research manager at IDC. "Santa is buying the gifts for herself." Best Buy started having personal shopping assistants after realising that women influence the majority of purchases made in the household and make up a significant number of its customers. They are also the ones who prize good customer service. Jeremy Clay knows what to tell the men coming into the shop to buy Christmas gifts for their wives because it is their wives that he mostly works with. 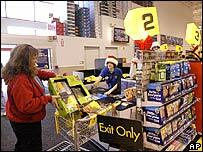 Best Buy has made an effort to change the way sales assistants talk to women, particularly trying to stop the common practice of ignoring a woman shopper in favour of their male companion. The same experience is to be had in the UK according to Margaret Heffernan, author and businesswoman. "It is universally horrible," she says. "It is quite amusing to hear sales people try to explain a product. "I know they don't know what they are talking about and they think it doesn't matter because I am a girl." "I buy online because I find going into electronic stores so annoying," says Ms Heffernan, who says she would like an iPod pre-loaded with her music collection this Christmas. Gadget makers are also trying to include female users more when thinking about product design, marketing and retail strategy. They are starting to recognise that women want lighter laptops and smaller devices and are often not as prepared as men to spend time setting up, or learning how to use, a new device. Sony designed its Walkman Bean MP3 players specifically to fit into a woman's hand and recently started shipping the new Vaio FJ notebook computers, which come in a range of colours. While the likes of tech giants like Motorola sell pink devices, many women deny they are looking for pink gadgetry, particularly for something that they use at work. "I hate the idea of creating technology in 'feminine' colors. I don't want pink. I am attracted to bold colors that may even be the same for men. For me it is about the sleek design and the style," one woman told IDC researchers. There is a market for pink products, but, says Dana Thorat at IDC, it is more likely to be among girls between 12 and 14 years old than a woman sitting in the boardroom. "But, you do have women who say; 'It would be nice to have my mobile phone match my suit'. Or, 'maybe there's a nice belt that I could wear it with'. "They are saying they would like some more choices in styles but don't go and make it pink either." It shows that there is a place for colour. For instance, yellow is a popular suggestion from women who use their phones for safety devices so they can find it easily. Ms Thorat says gadget makers need to differentiate between different kinds of women, from high-spenders with advanced needs to people who want basic devices, from teenagers and tweens to older adults. At the end of the day, it is about lifestyles and interests, rather than gender.